In most parts of the world, the food vs fuel debate and low yield per unit resource consumption have put a lid on every attempt to convert first- and second-generation energy feedstocks respectively into fuel. This is where third generation feedstocks like microalgae assume significance. First-generation feedstocks are those that can also be consumed as human food (e.g., corn, sugarcane, wheat); second-generation feedstocks are not normally used for human consumption (e.g., waste materials); while third-generation feedstocks take advantage of specially engineered micro-organisms such as microalgae as their energy source. Various methods have emerged to convert third generation feedstocks into fuel (see figure 1). However, no clear solutions have been found to convert microalgae into high quality and reliable gaseous fuel. This is what inspired Pratik Gholkar, a researcher with the IITB-Monash Research Academy, to try and develop a catalytic process to convert microalgae into tar- and char-free syngas. Tar cleaning is one of the major obstacles in commercialising the microalgal gasification technology. It can be achieved using high temperature (1000°C – 1200°C) gasification; however, this is an energy-intensive process. Pratik’s preliminary results have shown that reactive flash volatilization can be used to clean tar at temperatures as low as 600°C – 700°C. Pratik’s project is funded by JSW. 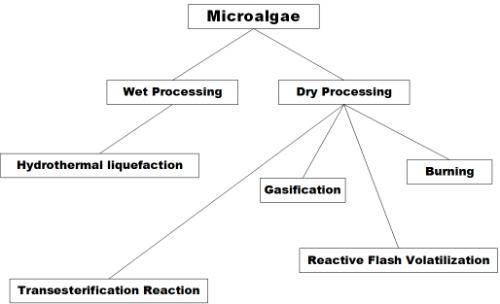 Project title: Catalytic conversion of microalgae into tar free methane rich gas using reactive flash volatilization.